The goal at Jackson’s Honest Potato Chips is to bring the potato chip back to its humble and simple roots by using the finest organic potatoes available and kettle frying them by hand using organic coconut oil. Why Coconut Oil? For starters it is nature’s most unique cooking oil: highly stable, full of “good” medium chain triglycerides, and nature’s most potent source of lauric acid. It’s become a staple in our own kitchen. But we also use it because it gives our chips the best flavor and crunch. Industrially processed polyunsaturated vegetable oils just don’t cut it anymore: try a chip cooked the way they were meant to be, in coconut oil. It will change your potato chip expectations forever. Made exclusively with organic potatoes and organic coconut oil and naturally gluten-free. 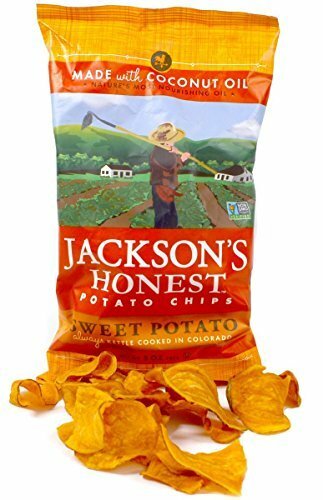 We hope you will enjoy Jackson’s Honest Potato Chips as much as we enjoy making them. From our kitchen to yours: honest in every way.Finally, healthy potato chips….